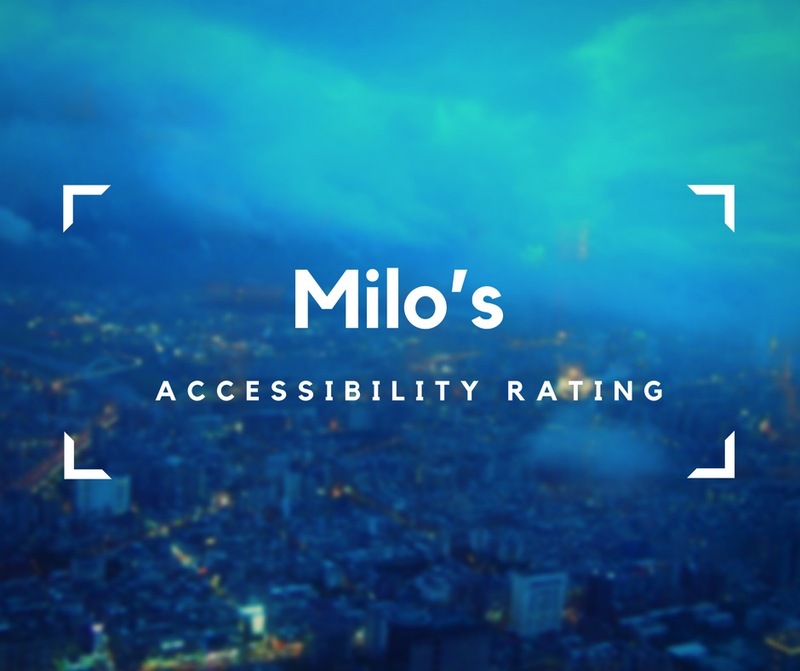 Today, I would like to introduce you to my ultimate accessibility rating of travel destinations. Travelling with a manual or electric wheelchair might be quite a a challenge, but .. You have to know, I’ve never been the one to resist a promise of adventure. Travelling has always been my cup of tea, and nothing has changed that. I’m not a person who believes in limits, but I am a great believer of challenges. Challenges are what makes us grow, and growth is life. Still, sometimes lack of challenging surprises is all we need. Especially when it comes to vacations. This is why I decided to share my travel experience with you. Our entire world’s full of wonderful places, but their accessibility varies – especially if a manual or electric wheelchair is a must. As much as your travel agent may say every destination could be your paradise, it is probably not true. Some places are wheelchair accessible only on touristic leaflets. As I’ve travelled a lot since my accident, trust me, I’ve seen all shades of accessibility. Many locations were, indeed, a dream come true, but others I’m glad I left unharmed. These are things I took into account when I created my ultimate accessibility rating. The rating’s graphically illustrated in a form of an infographic, as it makes the abundance of available information easier to digest and access. Here’s an exemplary infographic of The Dominican Republic, Puerto Plata. Each infographic is made of a several elements, which I’m going to describe below. On the top of each infographic, you can find out where I travelled in detail. First I include a name of a country, then a name of a place I visited. Sometimes I may include a name of a region or state, but generally, a combination “country + city” is a standard. When rating each place’s accessibility I focused on four aspects of accessible travelling, that I find the most important. These are – hotels, attractions, shops & restaurants and pavements. Each of them is rated on a 10-point scale, a score of 1 being the lowest rating and 10 being the highest one. How easy it is to find an accessible hotel? Are the hotel’s elevators are in a good condition, and the size that can accommodate your electric wheelchair? How accessible are the hotels? Are accessible hotels expensive, or is it possible to find something moderately priced? What’s the actual state of the hotel compared to the adverts? Are bathrooms’ doors wide enough for a wheelchair? Are there accessible showers or bathtubs in a bathroom? How easy it is to get to a hotel’s restaurant: are there ramps or stairs only? As you can see 9 out of 10 wheelchairs are fully visible, and only one wheelchair is shaded. It means that hotels received 9 out of 10 points. Their score is, therefore, 9/10. What I took into account when rating attractions? Here’s the answer! Are there elevators or ramps? How easy is it to find information about attractions’ accessibility? Can ramps be brought if there are only stairs? Are toilets on the same floor? How many curbs are there? Is the surface of the pavement even or uneven? Are there holes in the surface of the pavement? Are ramps mild or rather sharp in their gradient? Are there ramps at all? Do overhead passages have elevators? 7 visible and 3 shaded wheelchairs mean pavements got 7 out of 10 points. The highest possible rating in each category is 10, and the lowest possible rating is 1. 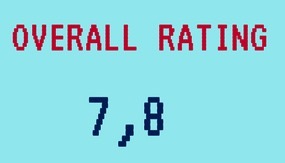 Overall rating is an arithmetic average of ratings from all categories. 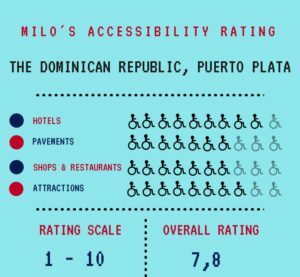 For example, Puerto Plata got 9 points for hotels, 7 for pavements, 8 for attractions and 7 for shops & restaurants, what gives us its overall rating: 7,8. Please note that some of the places in the rating were visited a long time ago, so things might have changed there. The rating’s also very personal, so I would say it’s everything but impartial. 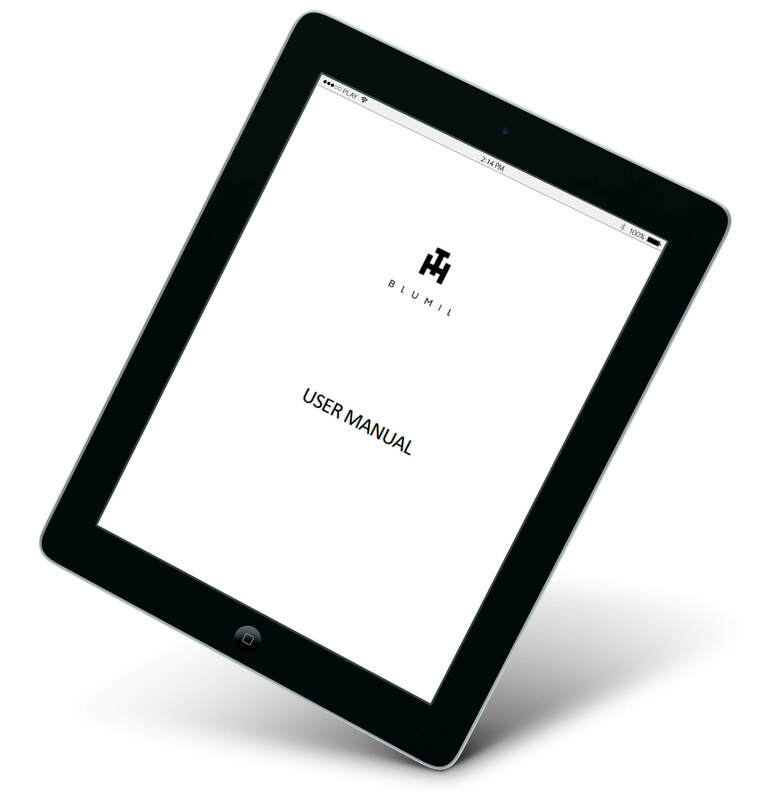 If you have any comments and want to add something, please share your knowledge with us – the more we know, the better! Information’s our best protection against surprises we wish to avoid. As you can see the infographic shows four categories: hotels, pavements, shops and restaurants and attractions. These are the most obvious factors I take into consideration when I rate accessibility of places I’ve visited – both on my manual, and electric wheelchair. First things first: the maximum score a place can get in each category is 10. The number of wheelchairs shows the score of a given place in a given category. Shaded wheelchairs signify missed points. Overall rating’s an average of our four basic categories and is the final rating of the place. Go ahead and enjoy!